Product prices and availability are accurate as of 2019-04-20 05:35:30 UTC and are subject to change. Any price and availability information displayed on http://www.amazon.com/ at the time of purchase will apply to the purchase of this product. 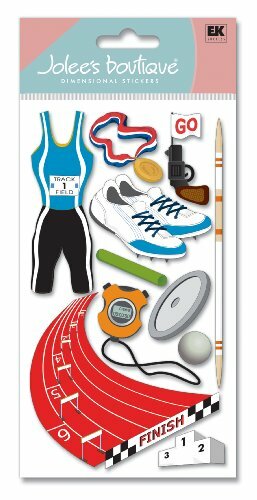 Jolee's Boutique track and field dimensional stickers. Track Jersey, cleats, stopwatch, track set up with hurdles and more are perfect for decorating cards, scrapbook layouts, and more for an athlete! make craft projects pop with texture and dimension with stickers known for their unique styling and broad range of designs. Sticker sheet measures 6.75 x 4 inches. 1 sheet per package.